Compared to other nuts, walnuts contain a large amount of the omega-3 fat alpha-linoleic acid (ALA). However, it’s important to remember that ALA (found in plants, nuts and seeds) can be converted to EPA and DHA (a form our body can use), but the process is inefficient. Seafood is a better choice to obtain Omega-3 fatty acids. Walnuts are an excellent source of fat to keep us full and satiated. They’re also a good source of vitamins and minerals including copper, manganese, magnesium and B vitamins. A study showed walnuts increased blood levels of melatonin in rats. When fed walnuts, the blood level of melatonin increased to 3.5 nanograms of melatonin per gram. Typical melatonin supplements contain between 0.5 and 5 milligrams. Melatonin is a hormone that helps to regulate circadian rhythms. *There is currently no %DV for choline. 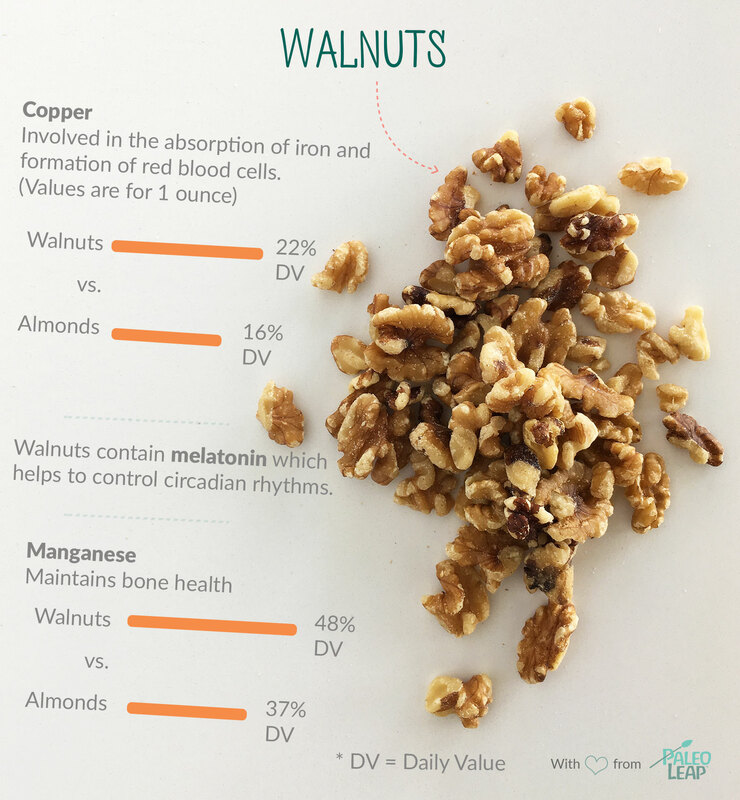 Orange dots show how 1 ounce of walnuts fit into the typical nutrient profile of a Paleo meal. SEASON: Walnuts are harvested in the fall months, late August through early October. STORAGE: Due to their high polyunsaturated fat content and fragility, walnuts are best stored in an airtight container in a cool, dark place. ALLERGEN: Walnuts are classified as a tree nut; tree nuts are a common allergenic food. Soak walnuts in water with a dash of sea salt for 4 hours, then dehydrate for 12-24 hours to reduce the phytic acid. Chop walnuts and add to a green salad or top a roasted vegetable. Use walnuts instead of pine puts in a pesto. Finely chop or process walnuts and coat salmon, pork or chicken for a walnut-crusted dish.